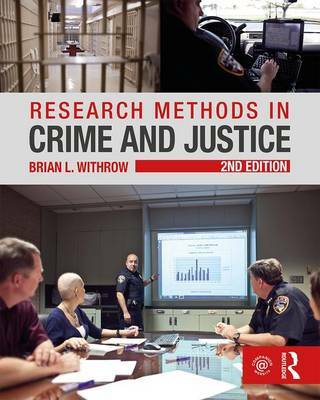 Research Methods in Crime and Justice, 2nd Edition, is an innovative text/online hybrid for undergraduate Criminal Justice Research Methods courses. This material uniquely addresses the fundamental teaching issue for this course: how to show students that success as criminal justice practitioners is linked to their acquisition of research skills. Brian Withrow, a widely published academic researcher and former Texas State Trooper, developed this approach for his own undergraduate Research Methods class. He persuasively demonstrates that research skills aren’t just essential to university academic researchers but to successful criminal justice practitioners as well. More than 80 short, sharply focused examples throughout the text rely on research that is conducted by, on behalf of, or relevant to criminal justice practitioners to engage students’ interest like no other text of its kind. Extensive web materials all written by the author provide an array of instructor support material, including a Researcher’s Notebook that provides students (and their instructors) with a series of structured exercises leading to the development of a valid research project. Withrow systematically walks students through defining a question, conducting a literature review, and designing a research method that provides the data necessary to answer the research question—all online, with minimal instructor supervision. The second edition features expanded coverage of measurement, qualitative research methods, and evaluation research methods, as well as additional downloadable journal articles to ensure students begin to think critically about research and can read scholarly literature.